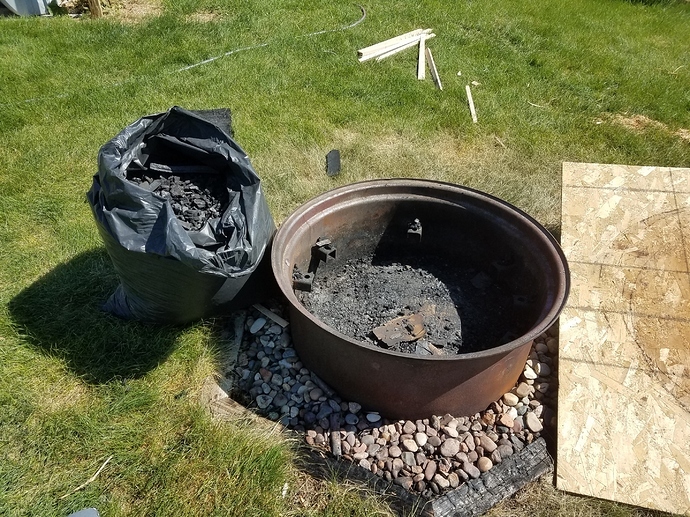 Anyone make their own biochar? I made a few batches of it last summer and tilled it into my garden. Supposed to be good stuff. I have access to a basically unlimited supply of oak scraps so figured id give it a shot. I should have taken more pictures, but maybe I will this spring when I do it again. Step 1: BURN During this phase all the ‘volatiles’ are leaving the wood. If the fire is enclosed so oxygen cannot get to the wood, the ‘char’ shouldnt burn much at all. Just the gasses being given off will burn when they come in contact with oxygen. Its kind of like wringing out a sponge. The vapor is burning leaving just char in its place, but the char wont burn unless O2 actually gets to it. Wood should turn from tan/brown to black during this phase. 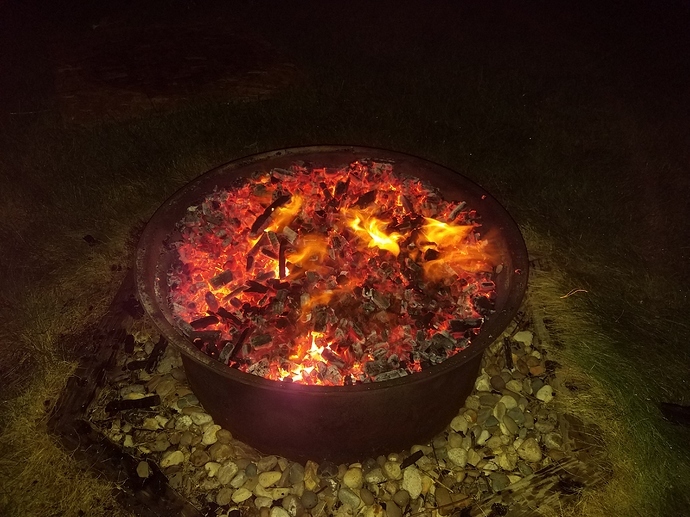 You can tell when its just ‘char’ because the flames will go away, all the wood will be black like charcoal and some pieces will start to turn to ash around the edges, whiteish looking. I usually stir it a few times to break up the larger pieces and this will often get some more flame to show up, but when its mostly gone, all you need to do is seal your container to end combustion. I use a sheet of fiberboard/sheathing with some rocks on top to hold it down and make my burn container air tight. Also before I put the cover on I spray the char down well with a hose to remove a lot of the heat and this also helps to end combustion. Theoretically you could just end it by spraying, but its easier for me to slow it significantly and then seal the container. Next day I have a big batch of ‘char’ to use how I like. make sure you soak it in some nitrogen source before tilling in or it will draw it from your soil or do like i did and till it in in the fall. works good to loosen my clay soil. What are you trying to accomplish by doing this? Biochar clearly works to filter runoff- at least for a little while- but what are you anticipating it will do mixed in with soil? Adding anything that has a pH north of 12(!) seems like a bad idea to me unless you are planting something that really needs super basic soil. Mostly Im doing it to try to loosen my clayish soil and because its free so might as well try it out. AND its fun to burn stuff… Now I just need to get the neighbors to quit calling the fire department! Biochar is recognised as offering a number of benefits for soil health. Many benefits are related to the extremely porous nature of biochar. This structure is found to be very effective at retaining both water and water-soluble nutrients. Soil biologist Elaine Ingham indicates the extreme suitability of biochar as a habitat for many beneficial soil micro organisms. She points out that when pre charged with these beneficial organisms biochar becomes an extremely effective soil amendment promoting good soil, and in turn plant, health. Biochar has also been shown to reduce leaching of E-coli through sandy soils depending on application rate, feedstock, pyrolysis temperature, soil moisture content, soil texture, and surface properties of the bacteria. For plants that require high potash and elevated pH, biochar can be used as a soil amendment to improve yield. Biochar can improve water quality, reduce soil emissions of greenhouse gases, reduce nutrient leaching, reduce soil acidity, and reduce irrigation and fertilizer requirements. Biochar was also found under certain circumstances to induce plant systemic responses to foliar fungal diseases and to improve plant responses to diseases caused by soilborne pathogens. 2O emissions by up to 80% and eliminate methane emissions, which are both more potent greenhouse gases than CO2. Studies have reported positive effects from biochar on crop production in degraded and nutrient–poor soils. The application of compost and biochar under FP7 project FERTIPLUS has had positive effects in soil humidity, and crop productivity and quality in different countries. Biochar can be designed with specific qualities to target distinct properties of soils. In an Columbian savanna soil, biochar reduced leaching of critical nutrients, created a higher crop uptake of nutrients, and provided greater soil availability of nutrients. At 10% levels biochar reduced contaminant levels in plants by up to 80%, while reducing total chlordane and DDX content in the plants by 68 and 79%, respectively. On the other hand, because of its high adsorption capacity, biochar may reduce the efficacy of soil applied pesticides that are needed for weed and pest control. High-surface-area biochars may be particularly problematic in this regard; more research into the long-term effects of biochar addition to soil is needed. Oak makes really nice biochar for potting mixes, it breaks up easily into small sheets which are themselves very resilient. I make char in a pit dug into the ground, burn prunings and slash from firewood I process. Added to the compost heap or as a bedding component in the chicken/duck coop (helps with odor). When I installed our asparagus beds, I lined the bottom of the trenches with biochar and I’ve seen a long term benefit to those plants in the 5 years since. Nowadays my compost always has some portion of biochar in it, I make a couple yards worth of compost every year. I like the idea of long term carbon sequestration, and providing habitat for the soil life, also seems to help with drainage and water retention. Sometimes I add a bit to planting holes when I put in a tree, but haven’t done so consistently or methodically enough to see if it has made any difference in the health or vigor of that tree. I use a tamper to break up the larger pieces into smaller stuff I can use in potting soil. Watch some of @SkillCult YouTube videos. He’s done a lot of work making biochar and even has experiments where he compared amended soil versus standard soil. Here is some technical information for those interested. I’m all about it here on my place in Northern California with acid soils that are not particularly high in natural fertility. There are a lot of claims about the mechanisms involved, but the bottom line for me is that there is a lot of very compelling anecdotal evidence and evidence for long term increased soil fertility and plant growth. Most importantly, it has worked well for me so far, so I’m all in and produce as much as I can. The most telling results have been in a particular garden bed with three sections for comparison, one being a control. I have many plans to set up more experiments. I think more people should do the same. Adding it randomly all over the garden doesn’t tell as much about it’s specific local effect. It seems to me that there is too little known and too many variables to safely make a broad recommendation on the use of the stuff. For me, I’m still testing what I think might be an ideal quantity/depth and configuration for general soil improvement in this particular soil. I have several garden bed experiments, two deeply amended artichoke planting sites with nearby controls and two huge tree planting pits 2 to 3 feet deep and 8 to 10 feet wide with a third 10 x 3 foot pit for a tree just started this week. I call these Catch Pits and they serve through the year to gather resources from the homestead that have soil building and fertilizing value, being gradually filled in as animal waste, weeds, dead chickens and such are thrown in there. The same would make a good latrine system. That may seem like a lot of work, but if it yields good enough results, it will be well worth it. I have to dig those holes anyway to get rid of that kind of thing, so it is serving double purpose. We’ll see how those sites do,. The first was doing very well, until the apple tree on it got a bad case of borers and now needs replacing. It did very well through two years of drought before that, relative to close by trees. For production, I use mostly two methods. Open piles and a trench. The trench is dug in the ground about 10 feet x 18 inches and with sloping sides. I start a fire and add one layer at a time. Each layer serves to shield the coals below from oxygen as it is used up before it gets down there. Once the pit is full, it is quenched. 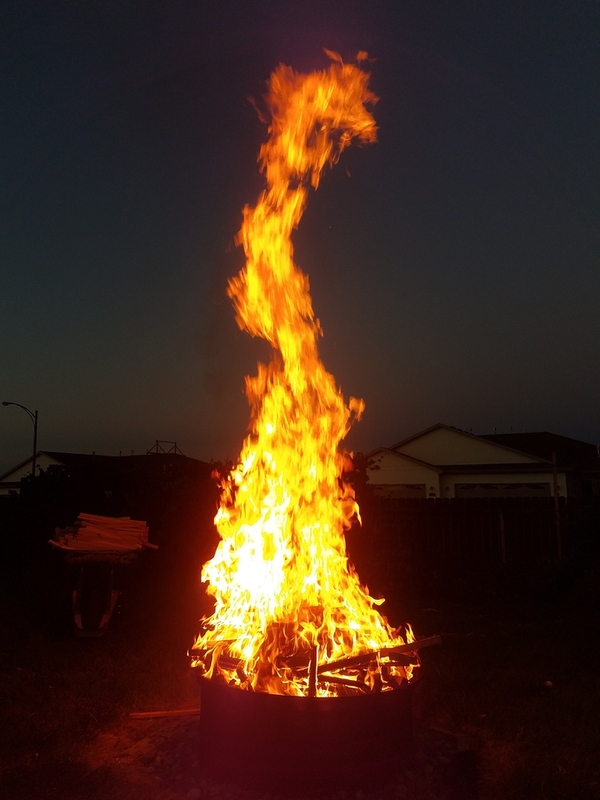 The other is a tall straight sided pile, lit from the top, tended a little as needed and then quenched. I have videos on both as well as one on why I use these methods over other methods in spite of sometimes questionable efficiency. The pit is used for solid wood, preferably about 1.5 to 3 inches diameter. Larger wood is not so good. in that system. The piles are used for leafy, tangly, low mass brush. Here is a link to my biochar playlist so far. https://www.youtube.com/playlist?list=PL60FnyEY-eJAfBgRAHKXjsNiUwqD1GTFK For the geekier, here is some fascinating research on the use of charcoal as a soil amendment in Europe and America in the 19th century. http://skillcult.com/blog/2012/05/18/some-citations-on-biochar-in-europe-and-america-in-the-19th-century BTW, I do not pre-charge my char. I bury it with extra food and try to apply some extra soluble fertilizer through the first crop. Saves time and energy and seems to work well for me. Crushing is still a big problem for me at the quantities I use. A large pit is upwards of 125 gallons of char and I have about 800 to 900 gallons accumulated right now, with more to be made in the next few months. If you have a rutted or humped driveway, that is a good place to crush char up by driving over it. I’ve done that in my gravel driveway with char and also pine bark (to make pine bark fines for potting mix). My 80’driveway can hold about 1.5 yds of material in the ruts, its not too hard to shovel it out once it’s broken down to 1/4" size. I don’t, by design. I also have a lot of loose gravel, so I’d lose quite a bit in there. I’ve thought about doing that wrapped in a big tarp of some kind, or making something like a trough to drive the tractor through. I think that might work okay if the char was sifted after especially. I have lots of ideas, but haven’t gotten to implementing any of them yet. I’m over crushing it by foot or hand grinders for sure. The scale is just too large now. I just joined this site to ask an unrelated question but, I wanted to make a quick comment to the biochar form. I could have only direct this comment to hoosierbanana but, it is worth sharing with everyone. I also mix in size / shape appropriate biochar into my potting mixes. I also turn sheets of old cotton clothing / cloth into biochar and, I use them to line the bottom of pots. They continue to drain / hydrate well and, all the potting mix does not run out of the holes in the bottom of the pots. When I transplant my plants in the spring from pots to the garden, I just toss the used carbonized cloth into the garden. I myself am not a fan of this product. Almost all of my plants like a slightly acidic soil, and with the hard water we have the last thing i want to do is add biochar or lime to my plants. The fig forums rave about lime, when the Universities all state figs like a slightly acidic environment. Not one said they like lime. It seems they can tolerate lime and grow where lime is. But that doesn’t mean you should add it. Also I see very few studies have been done on biochar and those that have, have produced inconclusive results. Rachel Smolker of Earth island Journal had this to say. So I guess half the studies showed increased yields? Still this really tells us nothing at all. It tells me the studies can’t be replicated with any degree of certainty. Peer reviewed is important, it confirms results from independent sources. So you have a 50-50 chance it will help. Lilacs will love it and it will kill blueberries. I do agree burning stuff is fun though! I have fires all spring, summer and fall. Rachel Smolker is codirector of Biofuelwatch and a climate justice activist. She has a Ph.D. in biology from the University of Michigan, and worked previously as a field zoologist. The ph of biochar balances over time. I use it to stabilize my sandy soil and i love it. That is really interesting Doug, I never thought of using fabrics. Do you use a retort? I watched this video on Youtube where a guy makes a foundry out of carbonized bread! Char is really an interesting material! Yeah I wish they would sort of the studies, because it appears to be useful in situations like you have.But not so useful and even harmful in others. The pH will not balance in containers being watered with hard water, that is my problem, and why I would not use it in containers. My ground is a perfect 6.5 with rich clay loam soil with high organic matter. So here again, I don’t see a benefit for me. I’m kinda lazy I won’t use compost tea either. i don’t want to spend time making stuff that may or may not be useful. In your situation I would just add ton’s of organic matter every year. That method is well documented to work, and work well. I think you should do what works for you, if not broken don’t fix it. Nothing broken here either. I just wanted to bring up to think about what you’re doing, not you in particular, you seem to know what you’re doing, anybody in general who reads this thread. in your situation i can see it would be valuable, but if I were to start it might have a negative effect on my soil and production would decrease. I don’t know? The studies tell a mixed tale. Once it’s sorted out I may come back and look at it again. So many on the internet say this works and that, so I like to see peer reviewed studies. Al who invented 5-1-1mix often stated not to use compost in containers as the fine material slows drainage. That it could cause root rot. Yet every study with compost in potting soil, and I mean every one of them shows that containers with compost hardly ever get root rot. It turns out many soil organisms in compost kill the root rot pathogen. Some compost works better than others, but all work to some degree. So I always add compost to my potting mixes. But many think it is harmful. Hey it was on the internet, it must be true. I have not added much biochar to soil, but in the one patch I did it really improved the texture of the soil, which is silty loam. I was a little worried I might see some nutrient deficiencies from the high ph or adsorbtion of fertilizer but there were no negative effects on what I’ve grown there so far. As a potting mix component it is really attractive because of its resilient structure, high cec, adjustable particle size, and air and water holding capabilities. It is not a cookie cutter solution though, anyone looking to be given simple answers instead of investigating for themselves is barking up the wrong tree. I just use a metal tin like you get cookies or popcorn in to make biochar. I can get them for pocket change in the thrift store and, I can get a few uses out of them before they fail. We have several campfires throughout the summer. I ask that the last person leaving the campfire remember to put the canister on top of the coals. The next morning everything is done and cooled off. Still, I do not bring any of the biochar fabric inside until days latter. I heard of a study that showed the possible translocation of harmful gasses to plant roots. U of IL . 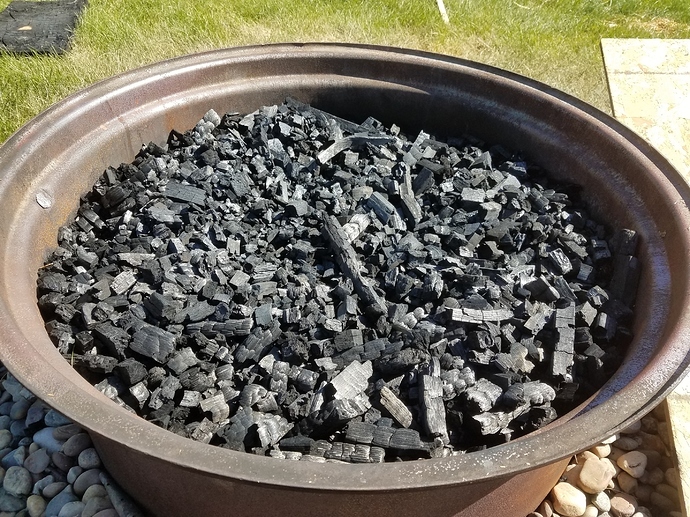 In the summery of the study “Using biochar as a soil amendment for sustainable agriculture” The study states biochar contains poly cyclic aromatic hydrocarbons (PCH) and is a carcinogen. The study suggested long term studies to determine if this is a problem or not. It may not transfer enough to the plants to be a health risk. No other studies have looked at this, so more have to be done.